4 month old ram lambs from the NAS (Northern Australian Sheep) family. Mules free, naturally bare breech with a tunnel of bareness running right down the twist. A high conversion, quick maturing, fast early growth rates family producing a low micron, fine white wool suitable for Northern Australian conditions of heat, humidity and low protein feed. Not only the world’s lightest non-prickle cloth, but a meat potential to rival dedicated meat producers. Many attempts have been made in the past to combine wool and meat traits but until now all have fallen down in delivering quality on both fronts. Not encumbered by tradition, Well Gully has developed a highly profitable Merino sheep with the desired meat and carcase traits, increased fertility and constitution – making for unequalled quality in both wool and meat. Below is a visual guide to the volume of high yeilding red meat that can be derived, while not sacrificing the ability to deliver an advanced wool performance, from a typical Well Gully Ram. This does not sound easy to do, but it is increasingly necessary to do. So much of Queensland’s grazing country requires the sheep and cattle to have the genetic metabolic capacity to thrive and not collapse on grass dominant pastures of high lignin content and low protein availability. At WELL GULLY, we have been selecting intensively for this trait in recent years. We want to breed a Poll Merino sheep that is comfortable in the northern Australian environment at all times – in reality, a sheep with “Brahman” capacity to survive and thrive. To do this, the sheep needs to have the ruminal microflora capable of breaking down high lignin pasture and to utilize efficiently the sparse nutrients that are released. We know that Merino sheep will vary from requiring about 4 to 9 kilograms of feed to put on one kilogram of body weight. We are focused on breeding the sheep that requires 4 kilograms of feed. We think that an equally important component is to co-develop a Poll Merino sheep that drinks less water per day for body maintenance. In fact, the two components seem to develop together and appear to be inextricably tied. Some of the interesting outward change we are seeing in our sheep is that their ears are getting appreciably longer, the animals pant less and look fitter and behave as if they are. We think the sheep are developing better evaporative cooling capacity. They spend less time walking to water and less time drinking and more time resting and grazing. The selected animals are achieving high body growth rates and excellent muscle patterning as juveniles on this natural diet. We are able to measure these traits genetically and use the information (breeding values) in our selection and mating decisions. The important breeding values for carcase traits for us are weaning weight, yearling weight, eye muscle depth and fat cover. Lifetime fecundity is a sensitive indicator of a sheep’s fitness to survive in our harsh environment. We record the stud ewe’s lifetime production of reared lambs. 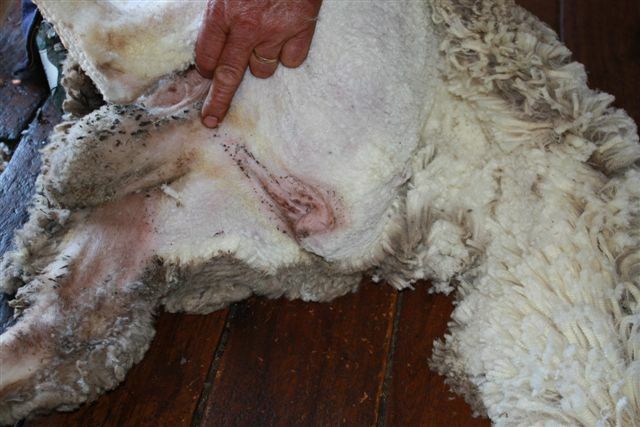 We value highly those ewes with the thin and loose skins, capable of producing high fleece weights of high quality wool, that maximize lamb production and lamb survival throughout the ewe’s life. If is , of course, underpinned by breeding a sheep that has the genetic capacity to digest and utilize the low nutritive pasture that is common to much of Queensland’s grazing country.